Additional view providing a closeup of the central pattern. Shown here is a view of the exterior of the bowl. 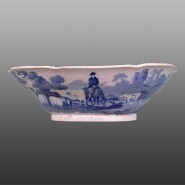 An earthenware fruit bowl printed in the Domestic Cattle series. This series was attributed to Thomas & John Carey on the basis of a documented piece bearing an impressed CAREYS factory mark along with the blue printed series name.